Zeolite Synthesis and Characterization; Catalysis; Mesoporous Molecular Sieves; Advanced Materials and Applications; Adsorption, Diffusion, Separation and Permeation; Natural Zeolites; Ion Exchange and Modification; Structure Analysis and Modelling. Crystalline solids with highly structured micro-scale pores are called zeolites. Their well-defined structure and large contact surface make them extremely useful as catalysts. Their most common use is in washing powders. Different features are caused by the shape and size of the pores and the presence of different metals in the crystal structure. Research is conducted both towards better understanding of the relations between form and function and towards identifying new possible uses. This title presents a collection of contributions from internationally renowned researchers in the field of the Science and Technology of micro and mesoporous materials. 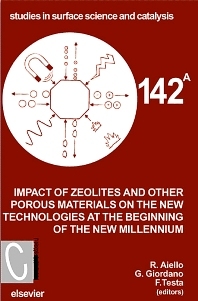 The aim of the conference is to create an international forum where researchers from academia as well as from industry can discuss ideas and evaluate the impact of zeolites, and other porous materials, on new technologies at the beginning of the new millennium. For deptartments of chemistry and chemical engineering; chemical companies; and scientific libraries.